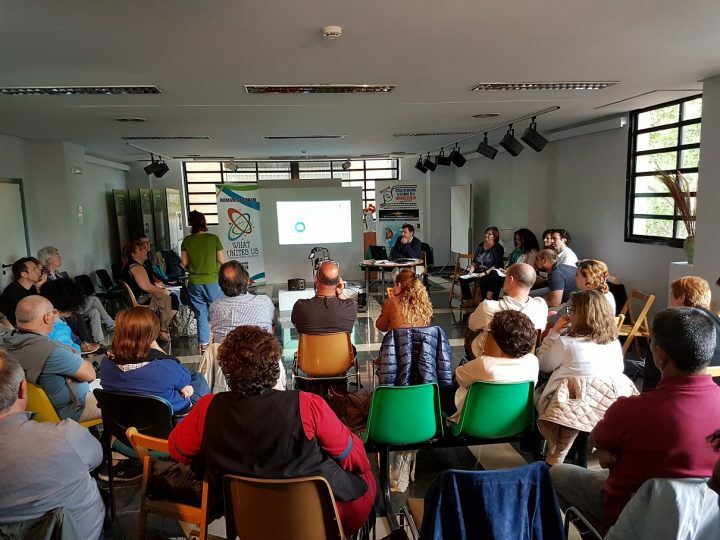 The Active Nonviolence International Film Festival (FICNOVA, Spanish Acronym) participated in the 5th European Humanist Forum held in Madrid from the 11th to the 13th of May, titled “What unites us towards the Universal Human Nation”. Members of the FICNOVA team in Madrid helped to organise the event, as part of a larger team of Spanish and European humanist volunteers. The event was realised with the help of Spain’s National University of Distance Education and the Junta de Vallecas local council of Madrid to whom we to express our sincere gratitude. More than 600 people from different European countries, together with some from America, Asia and Africa, participated in the 21 working areas of this Forum full of peace, strength and joy. After the opening, on Friday 11th in UNED’s Faculty of Education, everything was ready for the activities to start the next day in the El Pozo Cultural Center. On Saturday morning, three significant documentaries on the meaning of the Forum were screened in the auditorium. FICNOVA presented one of the award-winning films in its last edition: “Balkan Blues. Stories from Mostar” by the Italian director Lucio de Candia, who travelled to present his work and participate as a speaker. Lucio de Candia, with a degree in politics and a master’s degree in international relations, presented his work and expressed his interest in finding out what unites people, what helps to bridge differences. The example of the search for ways of reconciliation and nonviolence narrated in his documentary centred on Mostar, a diverse city in which different beliefs and cultures coexisted, and in which relations were dynamited after the disaster of the Balkan War, is inspiring. When pain and resentment for the wounds experienced stain the social atmosphere, an old popular music, the “sevdah”, spread by a group becomes a vehicle for feelings of reconciliation that again bring people of different nationalities, cultures and beliefs together. Their firm commitment to never repeat these events again feeds an entire artistic movement (music, poetry, photography…), supported by a radio and social networks for its dissemination. The screening moved the audience and many thanked the author for his inspiring work. In the afternoon, FICNOVA helped to create the working area “Images as a tool for change” together with Greek colleagues from World without Wars, Nikos and Evita, creators of the contest “Peace is….” and Tijen and Merobe, two Cypriot women (One Turkish Cypriot and one Greek Cypriot) who seek the unification of a divided country through their project “The other side”. FICNOVA was presented as a tool to show exemplary works from a humanist point of view that rescue the transforming force of nonviolence throughout the world and allow us to become aware of this possible direction. To this end, FICNOVA promotes the creation of spaces for interchange in which “spectators” become protagonists illustrated by such examples. This is done in many cities in different countries thanks to the collaboration of their authors and to the help of friends from different organizations and humanist fronts. The image that inspired FICNOVA was shared, the reference presented by Silo in his “Letters to my friends. On social and personal crisis in the present moment” which says:”…to humanize is to go beyond objectification to affirm the intentionality of every human being and the primacy of the future over the present situation. It is the image and representation of a possible and better future that allows the modification of the present and that makes every revolution and every change possible. Therefore, the pressure of oppressive conditions is not enough to set the change in motion, but it is necessary to warn that such a change is possible and depends on human action…”. From this point of view, and taking into account images as complex structures that transport the mobilising charge of our intention, we invited those attending to find the images that mobilize us in the direction of the Universal Human Nation and that we see as possible. The exchange was very enriching, but as the time available was very short, the group was open to continue working over time with all interested parties. The final highlight of the day was Diego Cruz, the singer-songwriter who admitted to having gone from making protest songs to “proposal songs” towards peace and nonviolence, and who raised us from our seats, accompanied by the clapping and dancing of many of those present. On the morning of Sunday the 13th, the summary work of the groups was carried out and then presented to the plenary by the coordinators of the different working areas. All the content worked on will remain on the forum’s website. Amidst laughter, hugs and the joy of knowing that we will see each other again in Rome in two years’ time at the 6th European Humanist Forum, the activity ended with the reading of the Final Declaration, which reinforced our projects. To round off the day, we went for lunch at Toledo Park of Study and Reflection, the inspiring humanist space where the representation of the mobilizing image of FICNOVA was formed and that those who did not yet know fell in love with (such as our friends Diego Cruz and Lucio de Candia).